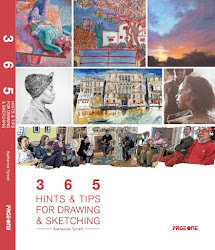 I'm off to St. Pancras Station tomorrow with my sketching group. 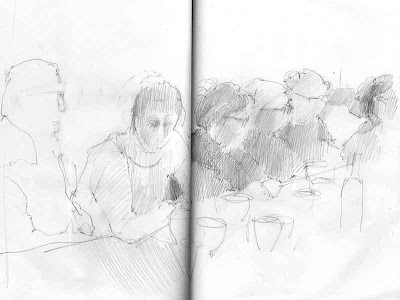 I'm posting this to see if anybody recognises themselves from my sketches of some of the members of the group during our lunch in Spitalfields in January. No names, no packdrill! 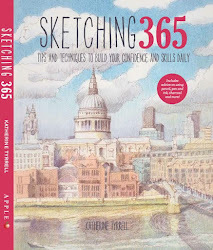 When sketching people sitting along a table, I always tend to draw the big shape first and then come back and work out how much information I need to provide for each individual. 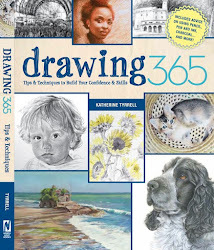 It's an approach which works really well when you're drawing contre jour (against the daylight) as I was - and you can't see a lot of detail in any case! 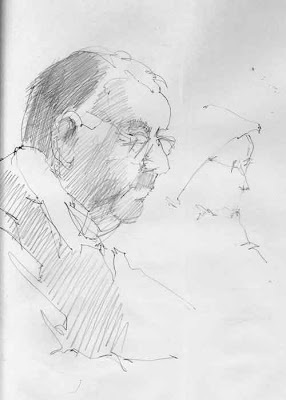 I love people who wear glasses - they make an additional aid which helps with drawing angles and proportions! 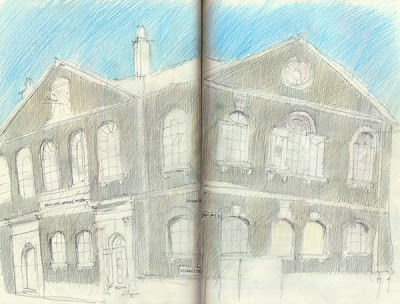 Last month, I went with the RWS Friends to Spitalfields for our monthly sketching trip. 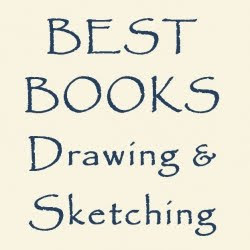 I did three sketches, nearly lost my sketchbook and acquired some new alpaca fingerless gloves with mitten enhancement! a Mosque for the latest wave of immigrants to the area - the Bengali community from Syhlet in Bangladesh who started to settle the area in the late twentieth century. 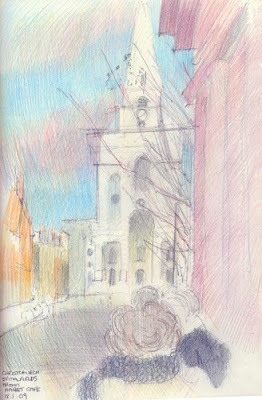 I stood to do this sketch in Brick Lane which is now a well know place to go for a curry in the East End. I used to go to the Clifton in Brick Lane some 30 years ago when it was still essentially a lunchtime cafe for garment workers and used to have formica topped tables, the most amazing murals of ladies reclining on the walls - and the one of the best tandoori in London! Fournier Street itself contains some very fine eighteenth century terraced houses built for the master weavers - with garret workshops with very large windows for the silk weaving. They're now all Grade II listed buildings. Fournier Street is also home to Gilbert and George (no. 12) and Tracey Emin. At the western end of Fournier Street is what is regarded as Nicholas Hawksmoor (1661-1734)'s masterpiece - Christ Church, Spitalfields. It's Grade 1 listed which means it is of exceptional historical interest and was built between 1714 and 1729. 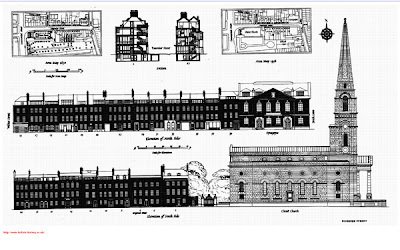 British History Online has details of the craftsmen's accounts for the building of Christ Church. I sat outside the Market Cafe in Brushfield Street which has the best view of the front of the church. Not to be confused with The Market Cafe in Fournier Street which used to be frequented by Gilbert and George and is now officially a "lost caff"
I'm going to save my people sketching for another post! 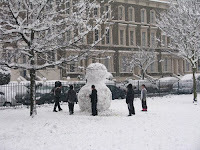 ...well actually there were quite a few snowmen assembled in the UK yesterday. Kids who have never ever seen snow like we had yesterday in London (6-8") and the southeast (8-12") were all out making snowmen. They were everywhere! Here's a selection of what I saw on my slow walk in the snow to the Ecology Park ponds and Victoria Park and back again. Half the newspapers commented on the travel chaos. Happily the other half found time to comment on what a wonderful day people had yesterday in the midst of the gloom and doom! 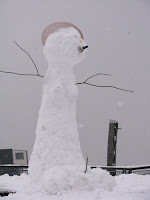 Walking in the snow, tobogganing, snowboarding, having snowball fights and making snowmen. As one person commented - everybody found time to talk to one another! Plus it was great fun watching the children experience heavy snow for the very first time. It was also noted that there were quite a few adult "children" out and about. 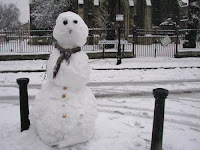 No sketching yesterday - all the seats were piled high with snow and total focus had to be maintained on staying upright! PS For the record I only fell over once and I was (rather stupidly!) crossing a grassy slope at the time! The snow was very dry and powdery so if you stuck to less frequented places and 'dry' patches it wasn't too difficult to walk. Today however the pavements look like they're lethal!